It is situated right in the heart of Raglan in Bankart St, behind the Town Hall. 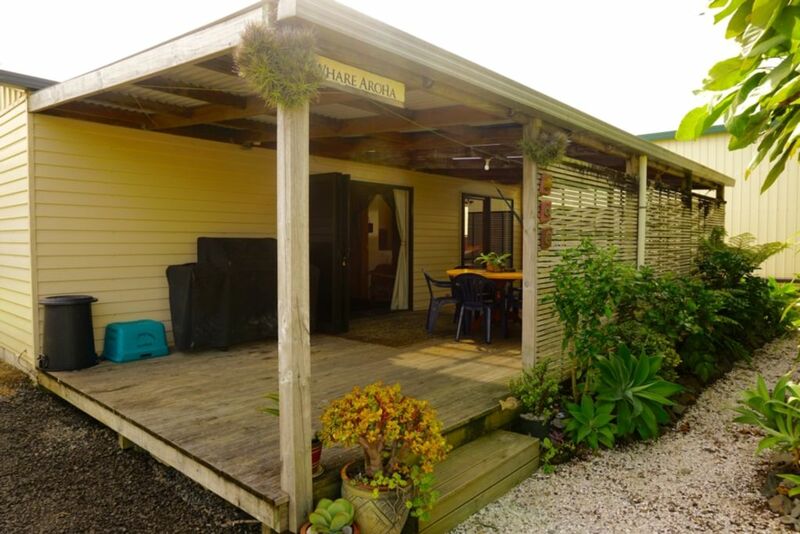 Located at the rear of another little "love shack' on the property, 'Whare Aroha' is private even though you are right in town. Once you park your car, which you can do right next to the deck of the Bach, you are only a few steps from all Raglans fantastic shops, cafes, entertainment venues and harbour. Walk out the gate behind the Bach and you are in the Main Street of Raglan Village. Enjoy your days activities and then a night out on the town and you don't have to worry about driving home...just 'wander'. Your can drive your car up the driveway and park right next to the deck. There is enough room to park another car behind. For some quick shopping supplies you can pop right next door to the new 'Four Square' Supermarket. Open from 6am-9pm Monday -Sunday. Our cosy bach has 1 queen bedroom, 1 queen 'loft bed' and a single day bed underneath the loft bed in the living area. The loft is only suitable for older children as it is accessed by a ladder and small children could fall. With no TV or internet, the entertainment is all up to you. Pop your IPOD in the IPOD dock and have a barbeque on the covered deck or read a book in the hammock. Or just wander to one of the fabulous cafes, bars or restaurants or buy some fish and chips and walk down to the harbour to enjoy the sunset. Come and enjoy 'Whare Aroha' and the delights of Raglan you won't be disappointed. The loft bed is not suitable for young children. If you use the barbeque, please leave it clean. We would really appreciate your thoughtfulness. Our place is unfenced but if you have a well behaved dog we will consider allowing your pet to stay. Please be aware however that dogs are not allowed in the Raglan village area. Warm, cosy and comfortable...you'll love it. There is room for parking 2 cars behind each other. Parking is available up beside the deck of our Bach. Please be aware of the overhang as you come down the driveway. The driveway is quite narrow past the house in front. 1 towel per guest. Bath mat provided. Please bring own beach towel. NO beach towels provided. It was a cute little place. Great location with nice cosy feeling. Thanks for the stay. Fantastic location - easy walk to coffee, ice cream and beach. Very clean and tidy. All necessities provided. Hammocks were the best part. Thanks for your lovely feedback. Yes, we love the hammocks too. Loved our time at Whare Aroha! Everything you need and a great location.